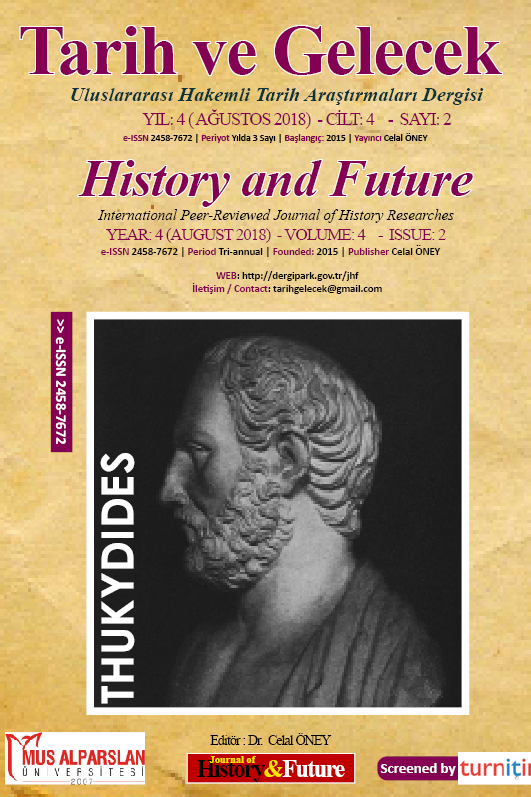 HISTORY AND FUTURE is a peer-reviewed international journal that publish original and qualified works with a scientific approach in the field of History. 1. Articles must be original (not plagiarism) and has never been published in another journal. If ever presented in the form of seminars, workshops, etc., say the name of the activity. 2. Articles are written by a program Microsoft Word to the top, A4 size paper, page margins: top 4 cm, left 3 cm, bottom 3 cm, and right 3 cm, typed with 1,5 density spacing, font Times New Roman 11 (Title 12, footnote 9). 3. Please submit your manuscript file as a Microsoft Word extension Document (DOC) only. 4. Title and Abstract write in Turkish and English, content manuscript can be written in Turkish or English. 5. The article goes into the desk editors selected by the editor. Articles can be accepted without repair, refurbishment accepted, or rejected, and the article is rejected is not returned unless requested by the author. · Title (in Turkish or English): written in a concise and informative, maximum 15 words (single-spaced, Bold, Center, Times News Roman14, UPPERCASE) should reflect the substance of the variables described in the article body. · Author:Without titles, the author can be an individual or a team ( Times News Roman12). · Affiliation and E-mail :Name of the institution (Times News Roman12).E-mail Address, which is located under the author's name (Times News Roman12)., italic). · Abstract: (in Turkish and English): the length of 150-200 words, abstracts written in one paragraph includes: scientific review article consists of a discussion of the core issues and substantially while the results of the research article consist of goals, methods, and results. The abstract is single-spaced and Italic for English. 1. Research Article consist of an A.INTRODUCTION, B.METHODS, C.RESULTS AND DISCUSSIONand D.CONCLUSIONS. 2. Review Article consist of an A. INTRODUCTION (preliminary scientific study) that shows the problems and framework of analysis, sub-subtitle that contains the B.DISCUSSIONand C. CONCLUSIONS. 3. Reference / Bibliography: use CMS Citation rules, cultivated from a primary source, and if it comes from the most current cultivated journals (3-5 years) and just acknowledgment of the source designated in the article body. Instead, the name that is referenced in the body must exist in the bibliography. Second row to the right of the entrance 7 letter. Here are some examples of writing a bibliography of several types of sources. Recommended to use Citation Software Ex. Mandeley, Zoteroetc. The Research Notes section provides a means for educational researchers to communicate with one another about their research-in-progress. The Research Notes are also a useful means for reporting on smaller research projects that have one or two findings of particular interest but do not warrant full-article treatment. The Note should report briefly on the author's/authors' research-in-progress or recently completed research and should feature work that has not been reported elsewhere in journal publications. This current work should be situated, briefly, in the context of other pertinent scholarship, including the author's or authors' related research. The focus of the Note could be either a specific study or an overview of an ongoing line of inquiry where fuller reporting of results will not occur in print for some time. The maximum length for a Research Note is 3500 – 5000 words excluding references and one or two tables or graphs. To encourage communication between researchers, authors of Research Notes are asked to provide contact information including a one-line biography, full mailing address, E-mail, fax, and/or telephone numbers for publication with each Note. This biography and contact information should be included in the document file submitted and Not abstract is required. Submissions to Research Notes will be reviewed for readability, rationale, clarity, logic, organization, length, and adherence to all HISTORY AND FUTURE’ guidelines. Any submission that is judged to meet these criteria will be published as soon as possible. Any submission that is judged to require revisions according to the criteria outlined will not be published, and revisions will not be invited as the Notes must be current if they are to serve the purposes identified. Please submit your research note electronically as a Microsoft Word through the submission feature of HISTORY AND FUTURE. Studies restricted to the fields of Islamic or Education. Studies performed must have the novelty of useful information for the development of science. Manuscript articles can be written in Turkish or English is recomended. The length of the manuscript of no more than 5000 words. The next order of writing seen on the Contributors Guidelines of Research. In certain cases when there is a serious error or suspected violations, HISTORY AND FUTURE will publish a correction and retraction. Corrections In the case of serious errors that affect the article by way of material (but not completely cancel the results), or significantly interfere with the reader's understanding or evaluation of the article, HISTORY AND FUTURE publish corrections records related to the published article. This article is published will be left unchanged. 4. it reports unethical research. An article which is pulled by issuing revocation notices associated with or replace the article withdrawn. HISTORY AND FUTURE will make every effort to clearly identify an article drawn like that. If an investigation is underway which may result in the revocation of an article HISTORY AND FUTURE can choose to remind readers to publish an expression of concern. The papers that are sent to HISTORY AND FUTURE are subjected to preliminary assessment by the Editorial Board to see whether the work complies with the principles of the journal. The papers that are out of the scope of the journal or do not comply with the format of a scientific text either in terms of content or style are either rejected or demanded to be corrected prior to peer-review process. Academic objectivity and scientific quality are the most important criteria for the assessment of the articles that are submitted to be published. The articles that comply with the publication principles of HISTORY AND FUTURE are sent to two reviewers who are known for their studies in the relevant field. HISTORY AND FUTURE Journal employs double-blind review system in which the names of neither the reviewers nor the authors are disclosed in any of the phases of the process. Reviewer reports are saved for five years. If one of the reviewers gives positive feedback while the other gives negative feedback, the article is either sent to a third reviewer or Editorial Board examines the reviewer reports to make the final decision. The authors submitting papers to HISTORY AND FUTURE take into account the criticisms and suggestions of the reviewers and the Editorial Board. The authors also have the right to object to the points with which they disagree. In the reviewing process, the publications of people with academic titles are only reviewed by academics of either an equal or a higher degree. Assessment process of HISTORY AND FUTURE may sometimes take long periods of time due to undesired reasons. Normally, preliminary assessment by the editor takes a week while reviewer’s assessment period takes 8 weeks. However, reviewer assessment process may get longer when reviewers do not respond on time or in cases of appointing a new reviewer and so on. The author/authors submitting papers to HISTORY AND FUTURE is/are considered to have accepted the aforementioned reviewing conditions and process of the journal. HISTORY AND FUTURE is published bi-annually. Regular issues come out in March and September. Additionally, a special issue is published annually, announcement for which shall be made on this website and relevant mailing groups. The names and e-mail addresses entered in this journal site will be used exclusively for this journal and will not be made available for any other purpose or any other party. HISTORY AND FUTURE provides instant access to its content to promote scientific research and favors the growth of scientific knowledge. In addition, the journal does not charge authors for any publication fee such as a submission fee or membership fee.